In our our series analyzing different monetary systems, we continue in Germany, where dozens of privately operated Regional Currencies circulate. The most important one is the Chiemgauer, turning over more than 5 million per year and growing at a rate of 100% per annum. It circulates in Rosenheim, Southern Germany, only 30 miles away from Wörgl, where Mayor Unterguggenberger launched his legendary ‘Freigeld’ experiment almost 80 years ago. The Regio Geld movement began after the introduction of the Euro. A reaction to the loss of the D-Mark that had served Germany relatively well since the Second World War. Germany enjoys an elevated awareness of monetary matters as a result of the horrible lessons of first the Weimar hyperinflation, then the excruciating deflation of the Great Depression, followed by Hitler’s interest-free economy. The basic rationale for the German regional currencies is to combat capital scarcity and capital costs. Let’s first analyze the Chiemgauer’s monetary architecture, and then see how it helps to alleviate these problems. 1 Chiemgauer = 1 Euro. Participants must accept Chiemgauer at this value. Basically this means that the Chiemgauer uses the Euro’s Unit of Account function. This is practical, because it avoids daily changing prices in Chiemgauer and allows price transparency for its users. Most ‘complementary currencies’, currencies circulating beside a dominant national unit, operate in this way. The downside is also clear: it imports Euro’s rising prices and leaves it vulnerable to Euro’s instability. However, these risks should not be overestimated: another unit of account can be used if Euro’s problems become acute. The Chiemgauer is a Euro backed unit and convertible to Euro. 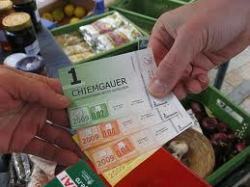 Firms and consumers can buy a Chiemgauer for 1 Euro of which 3 cents go to a local charity of the consumer’s choice. This is the basic incentive for individuals to pay with Chiemgauer instead of Euro. A further 2 cents are for the issuing organization to cover its costs. When a firm wants to convert a Chiemgauer back into Euro, it receives 95 cents. This is to motivate local firms to pay their suppliers with Chiemgauer, and thus keep the money in the local economy. Chiemgauer uses a demurrage: basically a tax on holding money. A Chiemgauer expires every three months. The one holding the note when it expires must pay 2% of the nominal value of the note to reactivate it. This is Silvio Gesell’s invention and it was also the secret of the Wörgl. By diminishing the ‘store of value’ function in this way, its ‘means of exchange’ function is enhanced. As a result the Chiemgauer circulates about 2,5 times faster than Euro, meaning less money is required to finance the same economic activity. Christian Gelleri, an economics teacher, created the Chiemgauer with his students in 2003. It faced a difficult start, with only a handful of firms willing to join the experiment. But it quickly gained traction. Chiemgauer is now accepted by over 600 businesses in the Rosenheim district, with about 500.000 inhabitants. It turns over more than 5 million Chiemgauer per year. Although this is only 0,2% of Rosenheim’s economy, the Chiemgauer’s turnover is growing at a whopping 100% per year. This means it will take only a few more years before it will become a major asset to the local economy. Gelleri is not shy in his ambitions: he expects the Chiemgauer to eventually finance about 50% of the regional economy. More is impossible, because taxation and international trade will continue to rely on euro. But it is clear that when this ambition materializes, it will raise many eyebrows and would imply a major assault on the Money Power’s currency monopoly. Gelleri has managed to provide the Chiemgauer with a solid footing in the community. By engaging local charities, who have a clear incentive to work with the Chiemgauer because of the 3% they get when people buy it, he has created a strong network of organizations promoting his unit. He has also managed to enlist a local bank, the anthroposophical GLS bank. Germany has a relatively decentralized banking system, where ‘Landes Banken’ have close relations with small and medium sized businesses. This is one of the key factors behind Germany’s post war economic success. The cooperation with GLS bank is important, because Euro backed and convertible units are only legal when they are restricted to paper notes. To allow bank accounts for the currency, a banking license is required. And to challenge Euro in the business world without a solid system of bank accounts is unthinkable in this era of internet and automated adminstration. So why is the Chiemgauer important? In the first place it is another clear example of a privately operated currency, without State backing. It proves a means of exchange can be completely paper based without State coercion. Money is anything that is agreed upon as a means of exchange. No coercion is necessary if the paper adds value for market players. Regional Currencies are important. If anything, the Euro crisis has made clear that monopoly currencies circulating in vast area’s like Europe, but also the United States, leads to imbalances between more and less competitive regions. The less competitive regions have a negative balance of payments, resulting in deflationary pressures in the local economy. Chiemgauer cannot be used outside the Rosenheim region and thus stops the leaking away of capital. It alleviates the pressures of capital scarcity and makes the region less vulnerable to international instability. Chiemgauer also addresses cost for capital: because it circulates 2,5 times quicker, the same amount of economic activity can be realized with only 40% of the money, implying 60% lower cost for capital (interest) for the community. The Chiemgauer’s key limitation is that it cannot provide interest-free credit. It is a Euro backed unit, not Mutual Credit. Chiemgauer does offer credit, which is a breakthrough in itself and quite uncommon for the time being, but it is priced at 7% per year. However, this limitation is partly offset by it’s much faster circulation. The Chiemgauer is a great success. One can survive for months on end in Rosenheim without spending one Euro. It leads the way for Regional Currencies worldwide. It proves that dedicated people can create cheap and abundant capital, notwithstanding annoying legal limitations. Chiemgauer is a wonderful inspiration in humanity’s struggle against the Money Power.